"Ah, no matter. I wish very much to know what is going on up there. If I ask my father, he will laugh at my curiosity, while you, Monsieur, if you are present at the conference, you will tell me all." A wish thus expressed was a command. The marquis bowed and obeyed. "She dismisses me," he said to himself as he ascended the staircase, "nothing could be more evident; and that without much ceremony. Why the devil does she wish to get rid of me?" Why? Because a single peal of the bell announced a visitor for Mlle. Blanche; because she was expecting a visit from her friend; and because she wished at any cost to prevent a meeting between Martial and Marie-Anne. She did not love him, and yet an agony of jealousy was torturing her. Such was her nature. 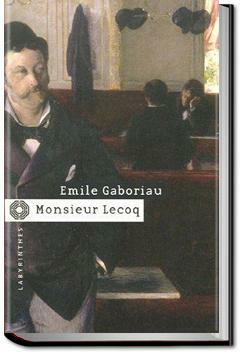 Sequel to Monsieur Lecoq. It happened that I read this one first, and that might have been why I didn't enjoy it as much since I missed the story set-up. Not really a mystery - more of an old-fashioned action-adventure tale with plenty of political intrigue. Often unnecessarily convoluted, but entertaining. needs to be read in conjunction with L'Enquete, which it resolves. Far too long a tale, IMHO. A strange mixture of 19th-century romantic fiction and early detective story.